WE'VE recently got to wondering: will Australians ever put the third Sunday of July into their diaries – like in America, where the day's been celebrated as National Ice Cream Day for over 30 years. 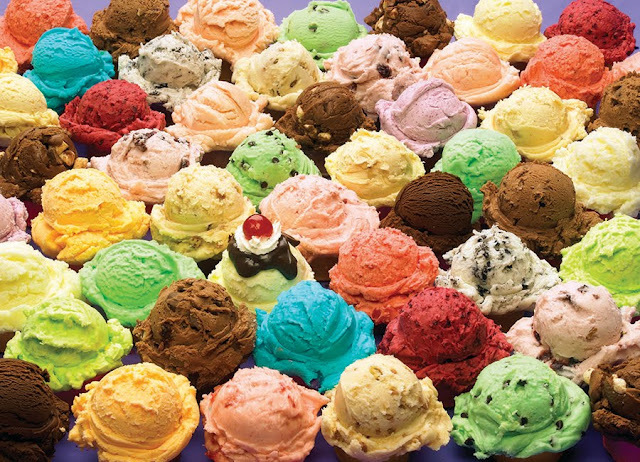 And it was by presidential decree, in 1984 ice-cream lovin' President Ronald Reagan proclaiming July as National Ice Cream month, and it's third Sunday as National Ice Cream Day. Yet bizarrely, despite their size and their presidential decree Americans are not the world's biggest consumers per capita of ice cream… would you believe that title goers to tiny New Zealand where the locals lick up 28.4 litres per person of the stuff annually… with the Americans in second place at 20.8 litres per person, and Aussies third at 18 litres per head. Which should be good enough reason for us all to put the third Sunday of July into our diaries for our own personal Ice Cream Day if industry or government won't do anything about it to make it official. And incidentally, as far back as 340BC Alexander the Great's chefs mixed him snow, ice, honey and nectar as a summer cooler, Marco Polo in the late 13th century took home to Italy a Chinese recipe similar to what we now know as sherbert and which eventually evolved into Italian ice-cream, while in England "cream ice" was served to Charles I in the 17th century. America's first ice-cream was recorded in 1744 in a letter written by Maryland Governor, William Bladen, while accounts show George Washington spent a whopping $200 on ice-cream during the steamy summer of 1790, strawberry-infused ice-cream was served in The White House in 1813… and the first commercial ice-creams hit America's streets in the mid-1800s.